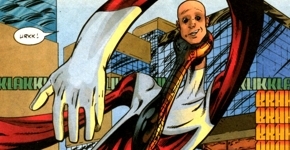 NOTE: Stretch-O created by Erik Larsen, with help from Keith Giffen and Victor Bridges. Chelsea Nirvana then attempted to seize control of the Vicious Circle with her new army of freaks but was defeated by CyberFace. Her followers were then largely folded into the ranks of the Vicious Circle. Stretch-O was drawn into another clash that involved ShadowHawk.